With sincerity and hard work of our experts, we have carved a niche for ourselves in this domain by manufacturing Fabric Cutting Machine. Banking on the skills of our qualified team of professionals, we are instrumental in offering supreme quality range of Portable Fabric Cutting Machine. Driven by vision to achieve significant growth in the industry, we are engaged in manufacturing a wide range of Corduroy Cutting Machine (With Plater System). Round knife cloth cutting machine. Longer life than any other machine. High quality parts for long life. India's most durable cloth cutting machine. 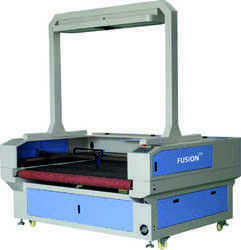 We are offering superb quality range of Fabric Laser Cutting Machine. 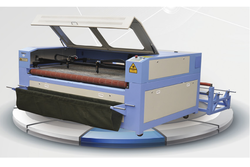 This Fabric Laser Cutting Machine is widely demanded in different textile industries. Our product range is highly appreciated amongst customers for its speedy performance and less maintenance. This machine can do cutting on any type of fabric.